If you're after high quality moped insurance at a reasonable price, then Bikesure, the specialist motorcycle insurance division of Adrian Flux, can help. We have access to a wide variety of special moped and scooter insurance schemes, and can offer cover tailored to your exact needs. With fantastic prices for learners, younger riders, experienced riders and commuters we can offer you a complete low-cost, high quality service. 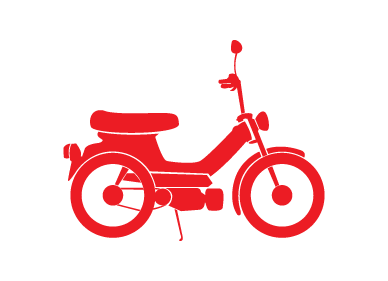 And as a specialist broker, we can offer you cheap moped insurance even if your moped is a classic, has been modified, or is one of the many Chinese imports available today. Use our online quote system right now to compare moped insurance quotes from our panel of underwriters and choose the one that suits you best. The problem is that a lot of motorcycle insurance companies don't understand the particular needs of the moped owner. They don't take account of the many ways in which mopeds, and their riders, differ from bikes, and as a result, the unwary moped rider may be charged over the odds. When you take out a moped insurance policy from Bikesure, you can be confident that the policy matches your needs as a moped owner. That's because we have access to an array of specialist insurance schemes, many of which have been designed for mopeds, including cheap moped insurance schemes catering especially for import chinese moped insurance. What's more, when you use our online moped quote and buy system you can instantly compare moped insurance quotes selected from those available and then choose which one is best for you. If you like the price you see you can buy online, or speak to one of our knowledgeable underwriters to take up the policy or discuss further options. From 50cc moped insurance designed for a learner through to highly specialist modified moped insurance quotes, we can cover practically any moped conceivable, including import mopeds that our rivals baulk at. All of our moped insurance products offer a good level of cover, and we also offer a range of add-ons to provide a complete service to motorcyclists, including Homestart Breakdown Cover, Personal Accident and Road Rage cover and Helmet and Leathers policies (which cover all your bike safetywear and equipment). Whatever your reason for riding a moped, we have a range of great discounts to help you save money. Although you can buy your moped insurance policy online, you can get better deals if you speak to us on the phone. We can take you individual circumstances into account to bring your price down substantially, because our staff can look at things in a less rigid way than a computer. UK based call-centres with highly trained staff mean we can answer any questions you might have and advise you on the features available from your policy. When I bought a moped on the internet, I had no idea I'd have to register it myself. I was in a chicken and egg situation, because I needed moped insurance before I could register it, but no-one would give me the cover until it was registered. Thankfully, Bikesure agreed to insure the moped using just the chassis number, allowing me to get my registration completed. Daniel is 29 and wants to save money on his commute to work, so he has bought a Yiying YY50QT-16. He has a provisional licence with CBT (Passed 2013) and has just purchased the bike. He lives in Eastleigh (SO53) and has one SP30 speeding conviction on his license, dating from 01/11/2012, for which he received 3 points and a £60 fine. He requires social domestic and pleasure use as well as commuting to his workplace. Daniel's rate is just £162.78 for TPF&T cover, or only £93.25 for Third Party Only protection. Owen, 29, hails from Lincoln(LN4) and has a Vespa Piaggio Fly 50 2009 model which is parked on his drive, as he doesn't have a garage. The bike cost him £850 and he can't wait to ride it - he's just passed his CBT. Owen will be using his bike as a cheap way of commuting to work. Owne's rate is just £142.88 for TPF&T cover, or £107.94 for Third Party Only.